Typically when collecting something, be it coins, cars or CPU’s having the most pristine unblemished example is highly desirable. However, sometimes, the best example is one that isn’t perfect, in coin collecting it may be a rare double struck coin, or some other flaw that actually makes the coin more valuable. In the 1970’s Intel put together many development kits for it’s processors. These were to help engineers, companies, and even students learn how to use Intel’s products. Intel made several kits specifically for University use, including one based around the MCS-80 processor and another around the MCS-48 microcomputer. 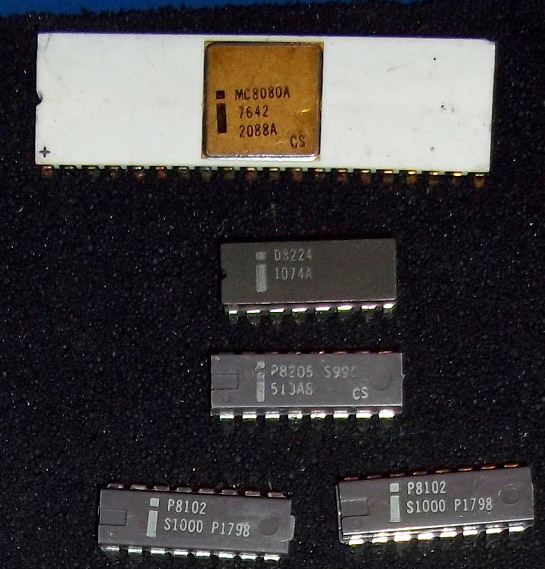 The 8080 University kit came with an 8080 processor, and a variety of support chips, including RAM, EPROMs (usually 1702s), clock drivers, bus drivers etc. They were often a mix of packages, including plastic, and ceramic, with many chips being marked ‘CS‘ which is Intel’s designation for a Customer Sample. Military MC8080A CS from a Uni kit. Multiple chipped corners. Such damage often was a result of improper packing in an IC shipping tube. The price of the kits was kept low, the purpose was to get people use to using Intel products, not to make money. Due to this, Intel tried to build the kits in the most efficient way possible. Almost every 8080 University kit included a working, but cosmetically damaged C8080A processor. These were typically the white/gold ceramic variety with a chipped corner. It was very common to see a MC8080A or MC8080A/B military spec processor in a University kit, the processor would function fine, but had some damage, enough that it could not be sold as a mil-spec processor (which has requirements for screening out such damage). The damaged chip would simply be tested, stamped ‘CS‘ and stuck in a kit, ths saving Intel money and keeping a working processor from being wasted. The same thing happened with the MCS-48 University kits, these included chips such as the D8035 or C8748 MCU, and again, often shipped with damaged chips. It turns out that the most correct, authentic chip, in a University Kit, was the cosmetically challenged, and in a way, this makes them more uncommon and more interesting. Its due to their damage that they were selected for the special use in a University kit. The irony is that many times it was the highest end military screened chips, that ended up getting used in one of the lowest end products.